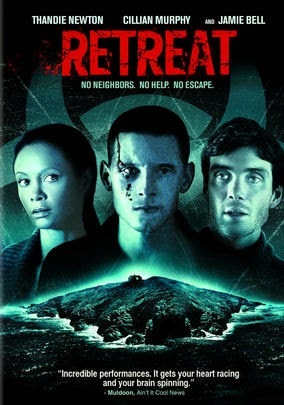 Retreat is one of those rare instances, of a film that is slow moving, with a simple story, but strangely fascinating. Films like this are completely reliant on the cast and most times simply don't work, but for some reason, I was really into Retreat and had to know if it was going to end the way I thought it would. As I said, the story isn't that unique, as it features a young couple, who try to reconnect on a secluded island off the cost of England. The island is a rich persons retreat and features one large cottage, that is occupied by one couple at a time. Martin and Kate think that it will be the perfect spot to reconnect, after the recent loss of a child, but the ideal retreat, soon becomes a hell on earth. A member of the army, a man named Jack (Jamie Bell) shows up in bad shape. When he wakes up, Jack informs the couple that a virus has taken hold over the mainland and if they leave the cottage, they could catch it. At first the couple goes along with Jack, but as his behavior becomes more irrational, the couple starts to question weather or not he's actually telling the truth. When you break the film down, it's three people in a cottage on an island, which doesn't sound very interesting, and the only reason this film works is Jamie Bell. The young star who got his start in Billy Elliott almost 15 years ago, has become a modern day Da Vinci in Hollywood, as he is seemingly everywhere and takes on all kinds of roles. Bell is as much an enigma as this film, as the last film I saw him in was some comedy, that was so bad I turned it off. A few months later, he's in this film and outshines everyone. If it wasn't for Bell's character and the fascination in finding out, what's in his head, this a film that would have gone nowhere. Jamie Bell is the key and really does give one of his best performances. Looking back and thinking about this film, it really wasn't anything special, except for one actor who makes all the difference. If you're into great performances, then Retreat is for you, but if you're more into the story then you might want to skip this one.